Interesting Read. Where are we as a country headed? An alarming number of political offices were filled by electing Muslims in 2018. Even more concerning is the high percentage of Muslims voting and their agenda to “change” our culture and society. Yes they do have an agenda to consolidate power inside a network of elected offices and controlled bureaus. I wonder who bankrolled their campaigns? and how did they get elected in areas where there was no Muslim population to cement the majority vote? A certain Party needs to groundswell some candidates. That us scary to say the least. We have now picked up the snake and clutched to our bosom and now we are warming it by the fire. Get prepared for that nasty bite that will lead to our death but we knew that before we brought it in didn't we? P.S. we are the silly woman in this poem. I posted this same things bout month ago or so just after Nov elections and no one really paid attention. And explain why were are suppose to be terrified of Muslims? There are 8 million Muslims in this country and to change the constitution it will take a supermajority for which they will never have. How is it you think they will ever obtain it? There you go again Peter aiding n abedding, sympathizing with a Sect enemy combatant who lie n wait and were banned from coming here long ago. I’m sick n tired of tryin to slap you out of your brainwashing... these people do not belong here and never did... they need to leave soon. This does not end peacefully. They can Leave peacefully on their own or they can DIE ! These are the options they get once the fighting starts. Do you understand what’s coming ? I didn't sympathize with anyone. 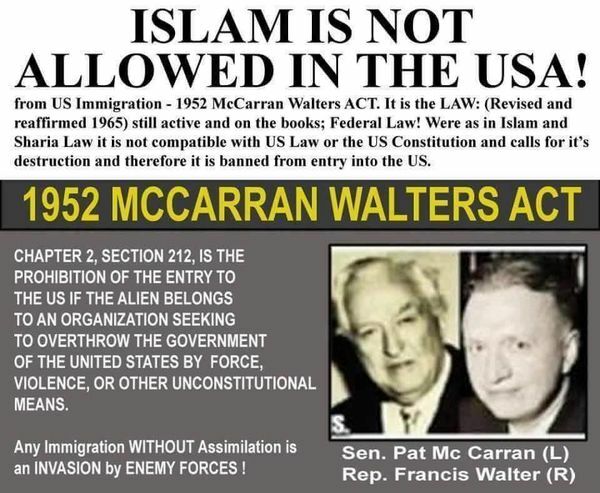 I simply wanted to know why you are so worried about Muslims when their numbers in this country mean they will never be able to change our constitution to do the damage you are so certain they intend. At the rate they produce children - it may take several years, but HAVE NO FEAR - a take over of America, of the World, is their goal. Obviously, they are patient and laughing at our blind complicity. I dont care if there’s just 1 of these scumbags here, it needs to leave too. You just dont get it bro, nothing has changed with these animals in 1400 years except technology and the ability to learn, read and write. I’ve studied their sick n twisted ways to colonizing HIJRAH, Taqqiyya etc... and I’m not buying it. you want to distance yourself from them starting now. I’m telling you we’re going to turn all this on it’s head, it’s already starting. You’ve been deceived into thinking this is acceptable. Your programming is contrary to our ethos. Wow!! I had no idea! Brigette Gabriel, a Lebanese woman whose house was bombed when she was a child and then lived in an underground bomb shelter for about 10 years after that has been sounding the alarm about the threats posed by muslims. Warning us that we're at a crossroads in our policies of allowing muslims to enter the US. She's spoken at the UN, before Congress, the Heritage, and countless other forums. She spends her life warning about the threat they pose but I never knew there were so many. Muslims are snakes. 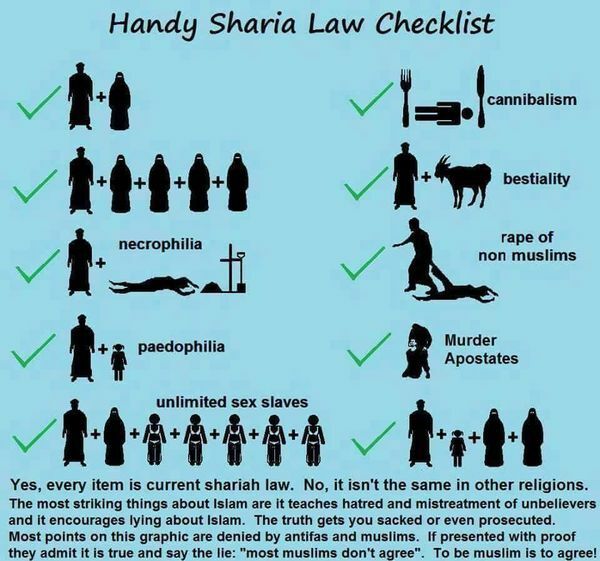 Their objective is Sharia law. They believe in a koran inspired by Satan himself. While we christians believe in an antichrist, described in the Bible as Satan, their carbon-copy version of the antichrist is their mahdi who will bring peace to the world. Hmmm. Wonder how that came about. And who could have authored it. Only one of those two versions can be correct. Not both. Muslims have no interest in assimilating. We shouldn't allow them in. Walid Shoebat gives his end times series and he is an ex Muslim and he became a Christian and he stated that after reading the bible that his wife persuaded him to purchase realized that his mahdi was the Christians anti Christ and that his religion was all backward to the bible. You can listen to Walid Shoebat on youtube by typing in his name and he is threatened daily by the Muslims that want him to shut up about the Muslim religion. Plenty of others who can warn you about the sick n twisted cancer of humanity called Islam. Your own Officials past and present have betrayed you with bad policy shaping bought and paid for by the minions at the CFR and TriLateral Commissions via Think Tanks lobbied and paid for by AIPAC amongst other Zionist CryptoJew and CryptoMuslims Kissing Cousins. If the Stupid Sheeple really knew what’s been manufactured in generational steps to colonize, transform, replace, repopulate, transplant via stealth Hijrah/Taqqiyya immigration then we’d have a Civil WAR Today.